C.M. Scarry, D.C. Haggis, M.S. Mook, R.D. Fitzsimons, W.F. Dibble, and C. Tsoraki, “Commensal Politics and Identity Performance at Azoria an Archaic City on Crete,” in C. M. Scarry, D.L. Hutchinson, and B.S. Arbuckle, eds., Ancient Foodways: Integrative Approaches to understanding Subsistence and Society in the Past (Gainesville: The University Press of Florida, 2018). W.F. Dibble, “Eating Animals at Azoria,” Kentro. The Newsletter for the INSTAP Study Center for East Crete 20 (2017) 16-17. R.D. 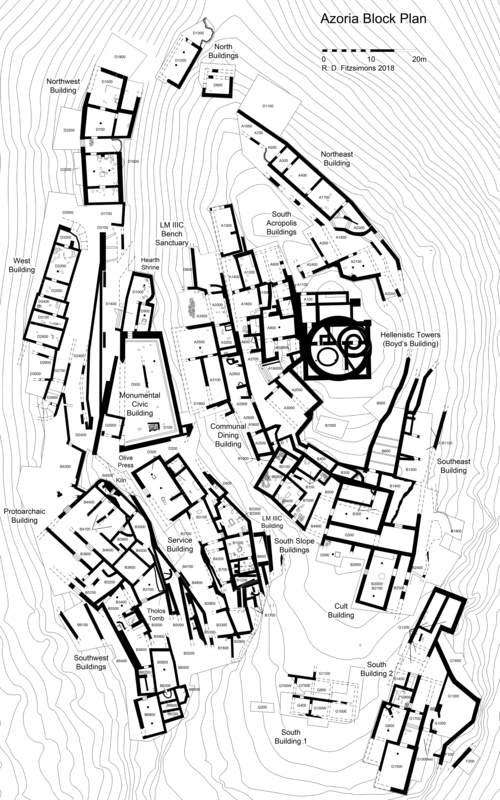 Fitzsimons, “Architectural Energetics and Archaic Cretan Urbanisation,” in D.W. Rupp and J.E. Tomlinson, eds., From Maple to Olive: Proceedings of a Colloquium to Celebrate the 40th Anniversary of the Canadian Institute in Greece (Athens: Publications of the Canadian Institute in Greece, 2017) 345-383. D.C. Haggis, M.S. Mook, and T. Carter, “Stratigraphic Excavations at Azoria in 2016: The Late Minoan IIIC, Protoarchaic, and Final Neolithic Occupation,” Kentro. The Newsletter for the INSTAP Study Center for East Crete 19 (2016) 5-14. D.C. Haggis, “The Archaeology of Urbanization: Research Design and the Excavation of an Archaic Greek City on Crete,” in D.C. Haggis and C.M. Antonaccio, eds., Classical Archaeology in Context Theory and Practice in Excavation in the Greek World (Berlin/Boston: Walter de Gruyter, 2015) 219-258. D.C. Haggis and M.S. Mook, “Stratigraphic Excavations at Azoria in 2015,” Kentro. The Newsletter for the INSTAP Study Center for East Crete 18 (2015) 18-23. W.C. West, “Informal and Practical Uses of Writing on Potsherds from Azoria, Crete,” Zeitschrift für Papyrologie und Epigraphik 193 (2015) 151-163. W.F. Dibble, “Practical Use of Barcodes in Archaeology,” Kentro. The Newsletter for the INSTAP Study Center for East Crete 17 (2014) 5-6. R.D. Fitzsimons, “Urbanization and the Emergence of the Greek Polis: The Case of Azoria, Crete,” in A. Creekmore and K. D. Fisher, eds., Making Ancient Cities: Studies of the Production of Space in Early Urban Environments (Cambridge: Cambridge University Press, 2014) 288-338. D.C. Haggis, “Azoria and Archaic Urbanization,” in F. Gaignerot-Driessen and J. Driessen eds., Cretan Cities: Formation and Transformation. Actes de colloques 2014: La naissance de cités crétoises, Aegis 7 (Louvain-la-Neuve: Université Catholique de Louvain, 2014) 119-139. D.C. Haggis, “Excavations at Azoria and Stratigraphic Evidence for the Restructuring of Cretan Landscapes ca. 600 BC,” in O. Pilz and G. Seelentag, eds., Cultural Practices and Material Culture in Archaic and Classical Crete: Proceedings of the International Conference, Mainz, May 20-21, 2011 (Ein neues Bild Kretas in archaischer und klassischer Zeit: Kulturelle Praktiken und materielle Kultur im 6. und 5. Jh. v. Chr.) (Berlin: Walter de Gruyter, 2014) 11-39. D.C. Haggis and M.S. Mook, “Stratigraphic Excavations at Azoria in 2014,” Kentro. The Newsletter for the INSTAP Study Center for East Crete 17 (2014) 3-9. D.C. Haggis, “Some Thoughts on the Conservation of an Archaic Greek City on Crete,” Heritage, Conservation & Archaeology (Archaeological Institute of America, Site Preservation Program, November 2013) 1-7 (http://www.archaeological.org/news/hca/14256). D.C. Haggis, “Social Organization and Aggregated Settlement Structure in an Archaic Greek City on Crete,” in J. Birch, ed., From Prehistoric Villages to Cities: Settlement Aggregation and Community Transformation, Routledge Studies in Archaeology (New York: Routledge 2013) 63-86. D.C. Haggis and M.S. Mook, “Excavation of the Early Iron Age Settlement at Azoria,” Kentro. The Newsletter for the INSTAP Study Center for East Crete 16 (2013) 3-9. M.S. Mook and D.C. Haggis, “Excavation of an Archaic City at Azoria in Eastern Crete,” in W.-D. Niemeier, O. Pilz and I. Kaiser, eds., Kreta in der geometrischen und archaischen Zeit. Akten des Internationalen Kolloquiums am Deutschen Archaeologischen Institut, Abteilung Athen 27.-29. Januar 2006, Athenaia Band 2 (Munich: Hirmer Verlag, 2013) 59-76. D.C. Haggis, “The Structuring of Urban Space in Archaic Crete: An Example of Settlement Development from the Early Iron Age to Archaic Periods,” in J.-P. Descoeudres and S.A. Paspalas, eds., Zagora in Context: Settlements and Intercommunal Links in the Geometric Period (900-700 BC). Proceedings of the conference held by the Australian Archaeological Institute at Athens and the Archaeological Society at Athens, Athens 20-22 May 2012 (Mediterranean Archaeology 25 (2012) ) 201-215. D.C. Haggis and M.S. Mook, “Chapter 31. The Archaic Houses at Azoria,” in K.T. Glowacki and N. Vogeikoff-Brogan, eds., Stega: The Archaeology of Houses and Households in Ancient Crete (Princeton: American School of Classical Studies at Athens, 2011) 367-380. D.C. Haggis and M.S. Mook, “The Early Iron Age-Archaic Transition in Crete: The Evidence from Recent Excavations at Azoria, Eastern Crete,” in A. Mazarakis-Ainian ed., The “Dark Ages” Revisited: An International Symposium in Memory of William D. E. Coulson (Volos: University of Thessaly 2011) 515-527. D.C. Haggis, M.S. Mook, R.D. Fitzsimons, C.M. Scarry, and L.M. Snyder, “Excavation of Archaic Houses at Azoria in 2005-2006,” Hesperia 80 (2011) 431-489. D.C. Haggis, M.S. Mook, R.D. Fitzsimons, C.M. Scarry, L.M. Snyder, and W.C. West, “Excavations in the Archaic Civic Buildings at Azoria in 2005-2006,” Hesperia 80 (2011) 1-70. M. Eaby, “Ένας θολωτός τάφος από τον Αζοριά Καβουσίου,” in M. Adrianakis and I. Tzachili, eds., Αρχαιολόγικο ‘Εργο Κρήτης 1, Πρακτικά της 1ης Συνάντησης, Ρέθυμνο, 28-30 Νοεμβρίου 2008 (Rethymno 2010) 170-178. D.C. Haggis and M.S. Mook, “The Azoria Project,” in “ASCSA in the Field,” Akoue 62 (2010) 11. M. Eaby, “Early Iron Age Cretan Tholoi,” in C.O. Aygün, ed., SOMA 2007. Proceedings of the XI Symposium on Mediterranean Archaeology, Istanbul Technical University, 24-29 April 2007, British Archaeological Reports International Series 1900 (Oxford: British Archaeological Reports, 2009) 98-105. M. Eaby, “Χρήση και επαναχρησιμοποίηση των θολωτών ταφών της Κρήτης της πρώιμης εποχής του σιδήρου.” Amaltheia 39 (2008) 31-41. D.C. Haggis, M.S. Mook, L.M. Snyder, and T. Carter, “Excavations at Azoria 2003-2004, Part 2, The Early Iron Age, Late Prepalatial and Final Neolithic Occupation,” Hesperia 76 (2007) 665–716. D.C. Haggis, M.S. Mook, C.M. Scarry, L.M. Snyder, R.D. Fitzsimons, E. Stephanakis, and W.C. West, “Excavations at Azoria, 2003-2004, Part 1, The Archaic Civic Complex,” Hesperia 76 (2007) 243-321. D.C. Haggis, M.S. Mook, and Μανόλης Ι. Στεφανάκης, “Τρώτε και πίνετε άρχοντες: Καταναλωτικές ανάγκες, πολιτική δύναμη και κοινωνική ταυτότητα στον αρχαϊκό οικισμό του Αζοριά,” Kritiko Panorama 19 (January-February 2007) 78-97. D.C. Haggis and M. S. Mook, “Azoria 2006: Investigation of the Early Iron Age-Archaic Transition,” Kentro. The Newsletter for the INSTAP Study Center for East Crete 9 (2006) 10-14. D.C. Haggis and M.S. Mook, “Azoria,” Χρονικά B2 (ΚΔ’ Εφορεία Προϊστορικών και Κλασικών Αρχαιοτήτων), Αρχαιολογικόν Δελτίον 61 (2006) 1181-1187. D.C. Haggis and M.S. Mook, “Αζοριάς,” Χρονικά B2 (ΚΔ’ Εφορεία Προϊστορικών και Κλασικών Αρχαιοτήτων), Αρχαιολογικόν Δελτίον 60 (2005) 1069-1073. D.C. Haggis and M.S. Mook, “Excavations at Azoria in 2004,” Akoue 53/4 (2005) 5, 8. D.C. Haggis and M.S. Mook, “Azoria,” Χρονικά B5 (ΚΔ’ Εφορεία Προϊστορικών και Κλασικών Αρχαιοτήτων), Αρχαιολογικόν Δελτίον 56-59 (2001-2004) 551-554. D.C. Haggis, M.S. Mook, C.M. Scarry, L.M. Snyder, and W.C. West, “Excavations at Azoria, 2002,” Hesperia 73 (2004) 339-400. D.C. Haggis and M.S. Mook, “Excavations at Azoria in 2004: The Early Iron Age Settlement and the Final Neolithic Houses on the Southwest Terrace,” Kentro. The Newsletter for the INSTAP Study Center for East Crete 7 (2004) 6-9. D.C. Haggis and M.S. Mook, “Azoria,” Χρονικά B5 (ΚΔ’ Εφορεία Προϊστορικών και Κλασικών Αρχαιοτήτων), Αρχαιολογικόν Δελτίον 56-59 (2001-2004) 544-547. D.C. Haggis and M.S. Mook, “Excavations at Azoria in 2003,” Kentro. The Newsletter for the INSTAP Study Center for East Crete 6 (2003) 4-7. D.C. Haggis and M.S. 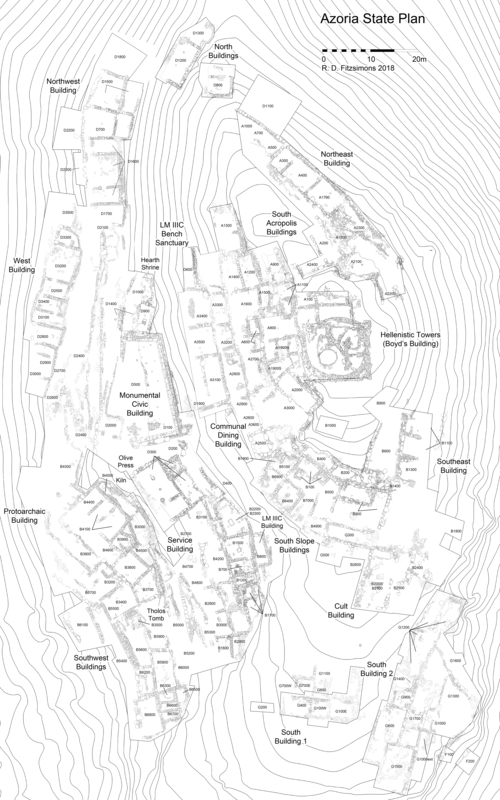 Mook, “Azoria Excavations Provide Clues to Organization, History of Early Cretan Polis,” Akoue 49 (2003) 3, 14. D.C. Haggis and M.S. Mook, “Azoria,” Χρονικά B5 (ΚΔ’ Εφορεία Προϊστορικών και Κλασικών Αρχαιοτήτων), Αρχαιολογικόν Δελτίον 56-59 (2001-2004) 540-542. D.C. Haggis and M.S. Mook, “The Azoria Project, 2002: A Study of Urbanization on Crete,” Kentro. The Newsletter for the INSTAP Study Center for East Crete 5 (2002) 4-7. W.F. Dibble, “Bones around Town: Depositional Patterns at Azoria, Crete,” International Conference of the International Council for Archaeozoology (ICAZ), Ankara, Turkey. September 2018. C.M. Scarry, M.S. Mook, and D.C. Haggis, “Agricultural Wealth, Food Storage, and Commensal Politics at Azoria an Archaic City on Crete,” 19th International Congress of Classical Archaeology, Bonn, Germany, May 2018. C.M. Scarry and W.F. Dibble, “Bridging the Divides at Azoria: Environmental Archaeology at an Archaic Greek City,” 83rd Annual Meeting of the Society for American Archaeology, Washington D.C., April 2018. C.M. Scarry, “Food and Identity at Azoria an Archaic City on Crete,” Departments of Anthropology, Classics, Botany, and the Western College Program, Miami University of Ohio, March 12, 2018. M.S. Mook, D.C. Haggis, M.C. Scarry, R.D. Fitzsimons, and W.F. Dibble, “Excavations at Azoria, East Crete, 2016-2017,” 119th Annual Meeting of the Archaeological Institute of America, Boston, Massachusetts, January 4-7, 2018. D.C. Haggis, “The Archaic Cretan City: Results of Recent Excavations at Azoria,” Center for the Ancient Mediterranean, Italian Academy, Columbia University, November 10, 2017. R.D. Fitzsimons, “It Takes More Than a Village to Raise a House: Building Practices, Labour Investment, and Urbanisation in Archaic Crete,” Keynote Address at the Annual Meeting of the Canadian Institute in Greece, Athens, Greece, May 17, 2017. C. Margaret Scarry, Donald C. Haggis, Margaret S. Mook, Rodney D. Fitzsimons, W. Flint Dibble, and Christina Tsoraki, “Commensal Politics and Identity Performance at Azoria an Archaic City on Crete,” Ancient Foodways: Integrative Approaches to Understanding Subsistence and Society in the Past, University of North Carolina at Chapel Hill, March 3-4, 2017. W.F. Dibble, “New Patterns in Ritual Animal Sacrifice at Azoria,” 118th Annual Meeting of the Archaeological Institute of America, Toronto, Ontario, Canada, January 7, 2017. W.F. Dibble, “From Carcasses to Cuts of Meat: A Zooarchaeological Assessment of Hind-quarter Processing in Ancient Greece,” From Snout to Tail: Exploring the Greek Sacrificial Animal from the Literary, Epigraphical, Iconographical, Archaeological, and Zooarchaeological Evidence, Department of Archaeology and Ancient History, Uppsala University, Uppsala, Sweden, December 2016. M.S. Mook, D.C. Haggis, R.D. Fitzsimons, M.C. Scarry, and F. Dibble, “Excavations at Azoria, East Crete 2013-2015,” 117th Annual Meeting of the Archaeological Institute of America, San Francisco, California, January 6–9, 2016. D.C. Haggis, “The Politics of Consumption in an Archaic Cretan City,” American School of Classical Studies at Athens, Athens, Greece, December 10, 2015. (videocast). C.M. Scarry, “Food Production, Consumption and Identity at Azoria an Archaic City on Crete,” University of Tennessee, October 14, 2015. D.C. Haggis, “Το ελαιοτριβείο του 6ου αιώνα π.Χ. στην πρώιμη πόλη του Αζοριά Καβουσίου,” 1o Διεθνές Συνέδριο «Η ιστορική και πολιτιστική διάσταση της Κρητικής Διατροφής», Τμήμα Διατροφής και Διαιτολογίας του Α.Τ.Ε.Ι. Κρήτης; Οργανισμος Αναπτυξης Σητειας Α.Α.Ε. Ο.Τ.Α. ; Siteia, Crete, Greece, June 19-20, 2015. (videocast). D.C. Haggis, “Recent Excavations at Azoria and Problems of Settlement Structure in Archaic Crete,” Department of Classics, University of Cincinnati, Cincinnati, Ohio, March 23, 2015. D.C. Haggis, “Recent Excavations of an Early Greek City in Eastern Crete,” Haines-Morris Distinguished Lecturer, University of Tennessee, Department of Classics, American Institute of Archaeology East Tennessee Society, McClung Museum of Natural History and Culture, January 27, 2015. D.C. Haggis, “Recent Excavations at Azoria and Some Problems Regarding Urbanization in the Archaic Aegean,” Department of Classics, University of Tennessee, Knoxville, Tennessee, January 27, 2015. M.S. Mook, “Recent Research on the Archaic Greek City: Excavations at Azoria on the Island of Crete,” Archaeological Institute of America Iowa Society, University of Iowa, Iowa City, Iowa, November 3, 2014. W.F. Dibble, “Urban Butchery Patterns from the Athenian Agora and Azoria in Greece,” International Conference of the International Council for Archaeozoology (ICAZ), San Rafael, Argentina, September 2014. D.C. Haggis, “Research Design, Recovery Strategies, and the Conundrum and Conceit of Best Practices in Excavation: Some Thoughts on a Decade of Fieldwork at Azoria, Crete,” Managing Multidisciplinary Field Research Projects: Best Practices and Problem-solving Strategies Workshop, 115th Annual Meeting of the Archaeological Institute of America, Chicago, Illinois, January 2-5, 2014. M.S. Mook and D.C. Haggis, “Excavation of the Northwest Building at Azoria, Eastern Crete,” Reports from the Field: Greece and Cyprus, 115th Annual Meeting of the Archaeological Institute of America, Chicago, Illinois, January 2-5, 2014. D.C. Haggis, “Recent Excavations at Azoria and Some Thoughts on Urbanization in Archaic Crete,” Colloquium: From Ptolis to Polis: Issues in the Transition of Political Economies, American School of Classical Studies at Athens, Athens, Greece, November 26, 2013 (videocast). D.C. Haggis, “Recent Excavations at Azoria and Some Thoughts on Urbanization in Archaic Crete,” Corbett Lecture, Faculty of Classics, University of Cambridge, Cambridge, United Kingdom, November 21, 2013. C.M. Scarry, D.C. Haggis, and M.S. Mook, “Reconstructing Olive Oil Processing at Azoria: An Early Greek City on Crete,” 16th Conference of the International Workgroup for Paleoethnobotany, Thessaloniki, Greece, June 17-21, 2013. M.S. Mook and D.C. Haggis, “Evidence for a Late Geometric–Orientalizing Temple at Azoria, in Eastern Crete,” Prehistoric Crete, 114th Annual Meeting of the Archaeological Institute of America, Seattle, Washington, January 5, 2013. D.C. Haggis, “Excavations at Azoria and Settlement Structure on Crete in the Early Iron Age and Archaic Periods,” Zagora in Context: Settlements and Inter-communal Links in the Geometric Period (900-700 BC), The Athens Archaeological Society and the Australian Archaeological Institute at Athens, Athens, Greece, May 20-22, 2012. C.M. Scarry, “Food Storage, Consumption and Urban Politics at Azoria an Archaic City on Crete,” Fryxell Symposium, 77th Annual Meeting of the Society for American Archaeology, Memphis, April 2012. R.D. Fitzsimons, “How to Build an Archaic Greek City: Architecture and Urbanisation at Azoria, East Crete,” Department of Classics, McMaster University, Hamilton, Ontario, Canada, November 11, 2011. D.C. Haggis, “Public Dining and Ritual Consumption in the Archaic Civic Buildings at Azoria, East Crete,” 11th International Cretological Congress, Rethymnon, Crete, Greece, 21-27 October 2011. R.D. Fitzsimons, “A Tale of Three Cities: Urbanisation and Socio-Political Development at Archaic Azoria, Crete,” Urban Dreams and Realities: An Interdisciplinary Conference on the City in Ancient Cultures, Department of History and Classics, University of Alberta, Edmonton, Canada, October 21, 2011. D.C. Haggis, “Excavations at Azoria and Stratigraphic Evidence for the Restructuring of Cretan Landscapes ca. 600 B.C.,” Keynote Address at A New Picture of Crete in the Archaic and Classical Periods: Cultural Practices and Material Culture in 6th and 5th Century Crete, Johannes Gutenberg-Universität Mainz, Mainz, Germany, May 20-21, 2011. M.S. Mook, “The Evolution of the Greek City: Evidence from Azoria in Eastern Crete,” Archaeological Institute of America Lecture Program, Archaeological Institute of America Rockford Society, Burpee Museum of Natural History, Rockford, Illinois, April 14, 2011. M.S. Mook, “The Archaeology of Archaic Cretan Houses,” Archaeological Institute of America Lecture Program, Archaeological Institute of America Western Illinois Society, Augustana College, April 13, 2011. D.C. Haggis, “Social Organization and Aggregated Settlement Structure in an Archaic Greek City on Crete (ca. 600 B.C. ),” Come Together: Regional Perspectives on Settlement Aggregation, 76th Annual Meeting of the Society for American Archaeology, Sacramento, California, March 30-April 3, 2011. D.C. Haggis, “Farming, Feasting and the Foundations of the Early Greek City: Recent Excavations at the Site of Azoria, Crete,” Health, Nutrition and Fitness: From Ancient to Modern Times, Embassy of Greece, Washington, D.C., March 14, 2011. R.D. Fitzsimons, “Making an Archaic City: The Social, Political, and Architectural Correlates of Urbanisation at Azoria, East Crete,” Canadian Institute in Greece, Athens, Greece, March 9, 2011. M.S. Mook, “Urban Cooking at Azoria in Eastern Crete,” 112th Annual Meeting of the Archaeological Institute of America, San Antonio, Texas, January 6-9, 2011. M.S. Mook, “The Archaeology of Archaic Cretan Houses,” John H and Penelope Biggs Lecture, Archaeological Institute of America Lecture Program, Archaeological Institute of America Tampa Bay Society, University of South Florida, Tampa Bay, Florida, October 21, 2010. M.S. Mook, “The Archaeology of Archaic Cretan Houses,” Archaeological Institute of America Lecture Program, Archaeological Institute of American Gainesville Society, University of Florida, Gainsville, Florida, October 20, 2010. D.C. Haggis, “The Archaic Cretan City: Excavations at Azoria 2002-2006,” La naissance de cités crétoises, Archéologie et Histoire de l’Art, Collège Erasme, Université Catholique de Louvain, Louvain-la-Neuve, Belgium, February 2, 2010. R.D. Fitzsimons, “Urbanization and the Emergence of the Greek Polis: The Case of Azoria, Crete,” 74th Annual Meeting of the Society for American Archaeology, Atlanta, Georgia, April 22-26, 2009. M.S. Mook, “Exploring the Ancient Greek City: Excavations at Azoria on Crete,” Scranton Lecture, Archaeological Institute of America Lecture Program, Archaeological Institute of America Appleton Society, Lawrence University, Appleton, Wisconsin, March 2, 2009. M.S. Mook, “The Greek Kitchen: Public and Private Cooking at Azoria on Crete,” Mellink Lecture, Archaeological Institute of America Lecture Program, Archaeological Institute of America Madison Society, University of Wisconsin, Madison, Wisconsin, March 2, 2009. D.C. Haggis, M.S. Mook, and C.M. Scarry, “Archaic Olive Oil Production at Azoria in Eastern Crete,” 110th Annual Meeting of the Archaeological Institute of America, Philadelphia, Pennsylvania, January 8-11, 2009. W.C. West, “Graffiti Inscriptions on Pottery from Azoria, Crete: Mixed Ethnicities?” 140th Annual Meeting of the American Philological Association, Philadelphia, Pennsylvania, January 8-11, 2009. M. Eaby, “Ένας θολωτός τάφος από τον Αζοριά,” Παγκρήτια Επιστημονική Συνάντηση για το Αρχαιολογικό Έργο στην Κρήτη, Department of History and Archaeology, University of Crete; 28th Ephoreia of Byzantine Antiquities Rethymnon, Crete, Greece, November 28, 2008. M.S. Mook, “Excavating the Ancient Greek City,” College of Liberal Arts and Sciences Dean’s Distinguished Lecture, Iowa State University, Ames, Iowa, November 12, 2008. M.S. Mook, “The Excavation of an Archaic City on Crete,” American School of Classical Studies at Athens, Athens, Greece, February 19, 2008. L.M. Snyder and C.M. Scarry, “The Devil’s in the Details: Evidence of Provisioning, Preparation and Consumption Associated with Communal Dining at Azoria, an Early Polis in East Crete,” Food Fantasies, Fallacies, and Facts: Multidisciplinary Methods on Mediterranean Meals, 109th Annual Meeting of the Archaeological Institute of America, Chicago, Illinois, January 3-6, 2008. W.C. West, “Graffiti Inscriptions on Pottery from Azoria, Crete: Mixed Ethnicities?” The Objects of Greek and Latin Epigraphy, Joint APA/AIA Session: The American Society of Greek and Latin Epigraphy, 139th Annual Meeting of the American Philological Association and the Archaeological Institute of America, Chicago, Illinois, January 3-6, 2008. M.S. Mook, “Exploring the Ancient Greek City: Excavations at Azoria on Crete,” Archaeological Institute of America Lecture Program, Archaeological Institute of America Philadelphia Society, Bryn Mawr College, Bryn Mawr, Pennsylvania, October 9, 2007. M.S. Mook, “Exploring the Ancient Greek City: Excavations at Azoria on Crete,” Archaeological Institute of America Lecture Program, Archaeological Institute of America Pittsburgh Society, University of Pittsburgh, Pittsburgh, Pennsylvania, October 10, 2007. M.S. Mook, “Exploring the Ancient Greek City: Excavations at Azoria on Crete,” Oscar Broneer Memorial Lecture, Archaeological Institute of America Lecture Program, Archaeological Institute of America Central Pennsylvania Society, Pennsylvania State University, State College, Pennsylvania, October 11, 2007. D.C. Haggis, “Azoria (Crete) in the Early Iron Age-Archaic Transition,” graduate seminar, Crete: History and Culture (ca. 1190-67 B.C.E.) (P. Perlman), Department of Classics, University of Texas at Austin, Austin, Texas, September 17, 2007. D.C. Haggis and M.S. Mook, “The Early Iron Age-Archaic Transition in Crete: The Evidence from Recent Excavations at Azoria, Eastern Crete,” The “Dark Ages” Revisited: An International Symposium in Memory of William D. E. Coulson, Department of History, Archaeology and Social Anthropology, University of Thessaly, Volos, Greece, June 14-17, 2007. D.C. Haggis, “Recent Excavations at Azoria in Eastern Crete and the Problem of Urbanization in the Seventh Century B.C.,” Thomas L. Conklin Memorial Lecture, Department of Classics, Greek, and Latin, Wayne State University, Detroit, Michigan, March 7, 2007. M.S. Mook, “Exploring an Early Greek City: Five Seasons of Excavation at Azoria in Eastern Crete,” Archaeological Institute of America Lecture Program, Williamsburg, Virginia, February 7, 2007. M.S. Mook, “Exploring an Early Greek City: Five Seasons of Excavation at Azoria in Eastern Crete,” Inaugural William D.E. Coulson Archaeological Institute of America Lecture, Richmond, Virginia, February 8, 2007. M.S. Mook, “Exploring an Early Greek City: Five Seasons of Excavation at Azoria in Eastern Crete,” Inaugural William D.E. Coulson Archaeological Institute of America Lecture, Charlottesville, Virginia, February 9, 2007. M.S. Mook, “Storage and Status in the Early Greek City,” 108th Annual Meeting of the Archaeological Institute of America, San Diego, California, January 6, 2007. D.C. Haggis, “Recent Excavations at Azoria, Crete, 2002-2006,” North Carolina Society of the Archaeological Institute of America, Department of Classics, University of North Carolina at Chapel Hill, Chapel Hill, North Carolina, November 29, 2006. M.S. Mook, “The Greek Kitchen Revisited: Public and Private Cooking in the Late Archaic City, Evidence from Azoria,” Cultural Identity, Ethnicity and Patterns of Transitions in Dark Age to Archaic Crete (on the Occasion of the Centenary of the Priniàs Excavations), Italian Archaeological School, Athens, Greece, November 11, 2006. M.S. Mook, “The Archaic Pottery from Azoria, East Crete,” Pottery and Technology, 10th International Cretological Congress, Chania, Crete, Greece, October 1-8, 2006. D.C. Haggis, “Excavations at Azoria 2002-2006 and Urbanization in Early Iron Age and Archaic Crete,” New Excavations, 10th International Cretological Congress, Chania, Crete, Greece, October 1-8, 2006. R.D. Fitzsimons, “An Early Greek Polis in East Crete: Excavations at Azoria 2002-2006,” Trent University Archaeological Research Centre, Trent University, Peterborough, Ontario, Canada, October 18, 2006. D.C. Haggis, “Recent Excavations at Azoria, Kavousi,” Lecture of the Εταιρία Γραμμάτων και Τεχνών Ανατολικής Κρήτης, ΚΥΡΒΕΙΑ 2006 (Demos Ierapetra), Azoria, Crete, Greece, August 7, 2006 (in Greek). D.C. Haggis, “Archaeological Research in the Region of Kavousi,” Lectures in Honor of William Coulson, Demos Ierapetra and the Politistikos Syllogos Kavousiou, Kavousi, Crete, Greece, July 1, 2006 (in Greek). D.C. Haggis, “Recent Excavations at Azoria in Eastern Crete,” Institute of Archaeology, Ancient History and Classical Archaeology, University of Oxford, Oxford, United Kingdom, May 18, 2006. M.S. Mook, “Exploring an Early Greek City: Excavations at Azoria in Eastern Crete,” Departments of Classical Studies and Art History and Archaeology, University of Missouri, Columbia, Missouri, April 6, 2006. L.M. Snyder and C. M. Scarry, “Civic Production and Consumption at Azoria, East Crete during the First Millennium BCE,” 71st Annual Meeting of the Society of American Archaeology, San Juan, Puerto Rico, April 2006. R.D. Fitzsimons, “An Early Greek Polis in East Crete: Excavations at Azoria, 2002-2005,” Department of Classics, Queen’s University, Kingston, Ontario, Canada, March 26, 2006. L.M. Snyder and C. M. Scarry, “Foods in Context: Domestic and Public Production and Consumption in East Crete during the First Millenium B.C.,” 29th Annual Meeting of the Society of Ethnobiology, State College, Pennsylvania, March 2006. M.S. Mook and D.C. Haggis, “Excavation of an Archaic City at Azoria in Eastern Crete,” Crete in the Geometric and Archaic Period, German Archaeological Institute, Athens, Greece, January 28-29, 2006. L.M. Snyder and C. M. Scarry, “Foods in Context: Domestic and Public Production and Consumption in East Crete during the First Millennium B.C.,” 107th Annual Meeting of the Archaeological Institute of America, Montréal, Québec, Canada, January 5-8, 2006. D.C. Haggis, “The Corridor Houses at Azoria and the Organization of Urban Space in a Sixth Century Polis,” ΣΤEΓA, The Archaeology of Houses and Households in Ancient Crete from the Neolithic Period through the Roman Era, Ierapetra, Crete, Greece, 26-28 May 2005. D.C. Haggis, M.S. Mook, and L.M. Snyder, “Excavations at Azoria, East Crete 2004,” 106th Annual Meeting of the Archaeological Institute of America, Boston, Massachusetts, January 6-9, 2005. R.D. Fitzsimons, “An Early Greek Polis in East Crete: Excavations at Azoria, 2002-2004,” Humanities Day Symposium, Trent University, Peterborough, Ontario, Canada, December 15, 2004. D.C. Haggis and M.S. Mook, “Excavations at Azoria, East Crete 2004,” 84th Anniversary Meeting of the Classical Association of the Middle West and South, Southern Section, Wake Forest University, Winston-Salem, North Carolina, November 4-6, 2004. D.C. Haggis, “Recent Excavations at Azoria and Problems in Urbanization on Crete in the 7th Century B.C.,” Xth/2004 Graduate Symposium on the Ancient Mediterranean World, Department of Classics, Florida State University, Tallahassee, Florida, March 26, 2004. D.C. Haggis, “Azoria and the problem of urbanization on Crete,” Brock University Archaeological Society Symposium, States of Complexity: Perspectives on Sociopolitical Development in the Ancient Eastern Mediterranean, Brock University, St. Catharine’s, Ontario, Canada, March 20, 2004. M.S. Mook, “Excavation of an Early Greek City on Crete: The First Two Seasons of the Azoria Project,” Archaeological Institute of America Lecture Program, Archaeological Institute of America Omaha/Lincoln Society, Joslyn Art Museum, Omaha, Nebraska, March 7, 2004. D.C. Haggis, M.S. Mook, and L.M. Snyder, “Excavations at Azoria in Eastern Crete in 2003,” 105th Annual Meeting of the Archaeological Institute of America, San Francisco, California, January 2-5, 2004. D.C. Haggis, “Recent Excavations at Azoria and the Evidence of Urbanization in Archaic Crete,” Summer Lecture Series, INSTAP Study Center for East Crete, Pacheia Ammos, Crete, Greece, July 25, 2003. D.C. Haggis, M.S. Mook, and L.M. Snyder, “Excavations at Azoria, East Crete,” 68th Annual Meeting of the Society for American Archaeology, Milwaukee, Wisconsin, April 9-13, 2003. M.S. Mook, “The Azoria Project: Excavation of an Early Greek City on Crete,” General Session I, Annual Meeting of the Iowa Academy of Science (by invitation of William Cannon, Executive Director, Iowa Academy of Science), Des Moines, Iowa, April 2003. D.C. Haggis, “Excavation at Azoria and the Problem of Urbanization in Sixth Century Crete,” Department of Classics, University of Pennsylvania, Philadelphia, Pennsylvania, January 21, 2003. D.C. Haggis, M.S. Mook, and L.M. Snyder, “Excavations at Azoria, East Crete,” 104th Annual Meeting of the Archaeological Institute of America, New Orleans, Louisiana, January 3-6, 2003. D.C. Haggis, M.S. Mook, and L.M. Snyder, “Excavations at Azoria, East Crete,” 82nd Anniversary Meeting of the Classical Association of the Middle West and South, Southern Section, Birmingham, Alabama, November 7, 2002. D.C. Haggis, “Recent Excavations on the Greek Island of Crete,” Fall Meeting of the North Carolina Archaeological Society, Research Laboratories of Archaeology, University of North Carolina at Chapel Hill, Chapel Hill, North Carolina, October 19, 2002.